Acacia dealbata will grow to 30m.In cultivation it usually much smaller growing often restricted to under 8 metres. Generally short lived as it is over shadowed by taller species. A widespread acacia species that will also grow naturally along river beds as well dry positions where its growth tends to be a little stunted. 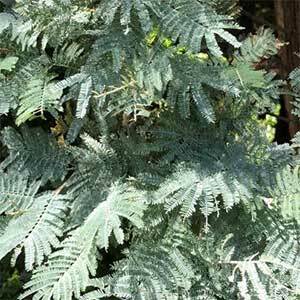 This is a fast growing tree with silvery blue green foliage. The foliage is ferny, and the flowers appear in dense sprays from winter through to spring are a golden yellow in colour. It does have attractive timber and is popular with furniture designers. Long straight grain good color, the timber is used both for veneers and solid furniture pieces. Timber is available for sale from commercially harvested regrowth plantations. Also very useful as a quick growing windbreak. In land reclamation this is a species that is able to fix nitrogen into the soil. Bushland Flora are suppliers od Australian native plants, specializing in indigenous tubestock, 14cm and 20cm pots. Grasses, trees, large shrubs, medium shrubs, tall shrubs and ground covers. CARAWAH NURSERY phone: 59674244 15 Falls Road Hoddles Creek Victoria 3139 Wholesale propagators specialising in Australian Native Tubestock. Our list comprises of hard to grow and pictorial lines. Monthly & Annual Forward Order catalogue. Accredited to all States.